This is the first in a series of short, easy hikes with little elevation change in Madison County, Alabama. 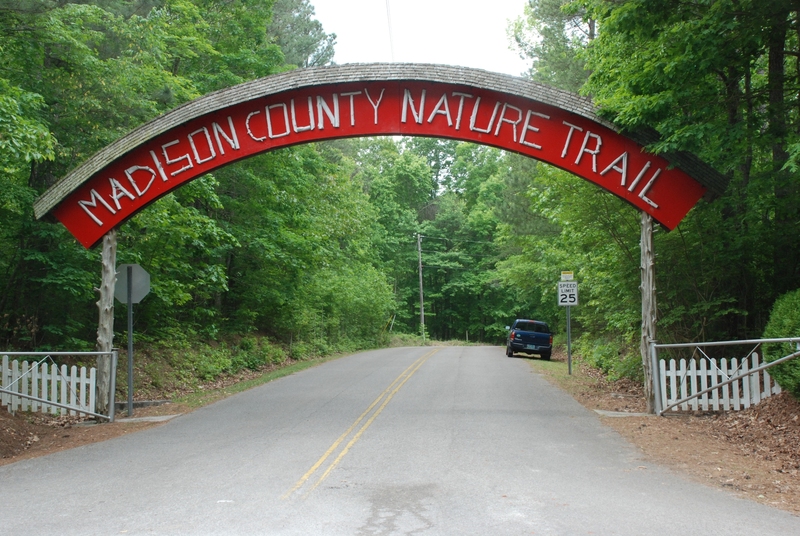 If you’re in the mood for a family-friendly walk in the woods with plenty of points of interest, the Madison County Nature Trail is the hike for you. I think this is the best hike in the county for young children, and adults will also find this short stroll around a scenic lake has its appeals. 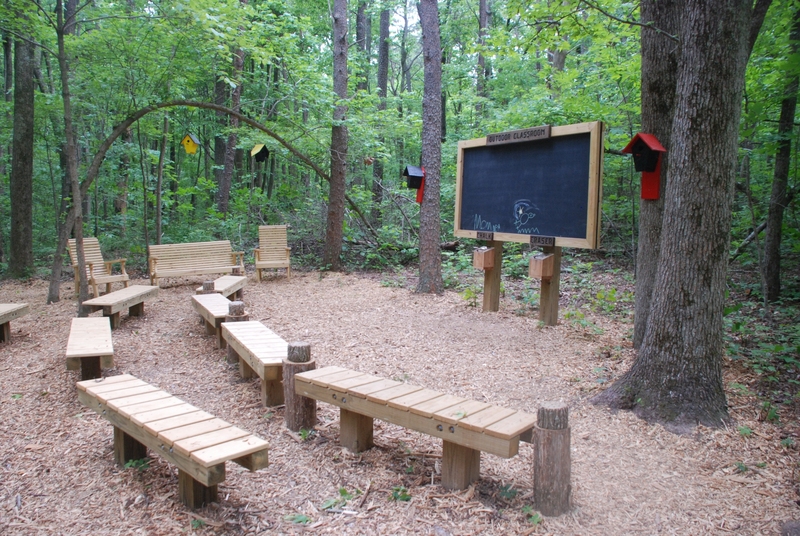 The Nature Trail is located on Green Mountain in southeast Huntsville. 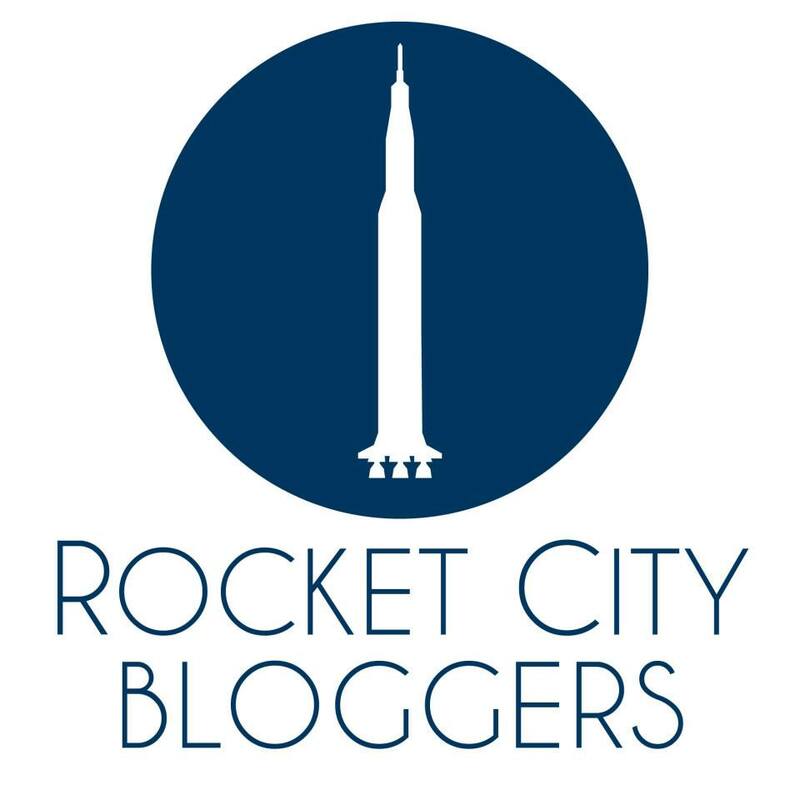 To get there, from South Memorial Parkway take Weatherly Road east, turn right on Bailey Cove Road, then left on Green Mountain Road, then turn right on South Shawdee Road and drive 1.3 miles to the park, which will be on your right. A rustically impressive entrance marks the way. There’s ample paved parking and an overflow lot if the place is busy. It wasn’t when we were there on a Friday at lunchtime, but this is a very popular destination and you can count on company, particularly in the summer and on weekends. Admission is free, and after passing through the entrance building and grabbing a trail map, we took a side trip to the Chaffin Shade Garden, a short (0.13 miles) meandering path through some pines and small hardwoods. 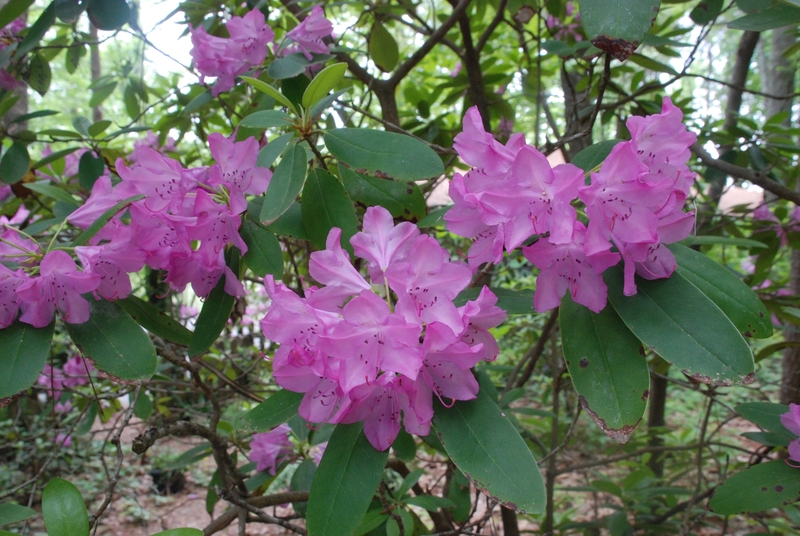 Built in honor of a long-time volunteer, the garden contains ferns and flowers in baskets, along with some shade-loving wildflowers such as partridgeberry and rhododendron. After leaving the shade garden, we walked past the east side of the picnic pavilion and took a moment to survey the picnic area and pier on Sky Lake. The picnic pavilion is a very nice facility, with numerous tables, restrooms, posters of the local flora and fauna, soft drink machines, ceiling fans, water fountain, and a porch area with chairs overlooking the lake. There is also a sizeable outdoor picnic area with tables and benches. This is a great place for a picnic, but I don’t remember seeing any grills there. The centerpiece of the 72 acre facility is Sky Lake. There’s a pier and numerous side paths to the edge of the lake for fishing, which is allowed Monday-Friday only for children under 16 and seniors over 60. There’s a $1.50 fee for fishing. The lake is a popular place for ducks and geese. We didn’t have any trouble from the geese this time, but be advised that they can be very territorial and will quite cheerfully chase and nip anyone who bothers them or their goslings. The nature trail loops around the lake, so we chose to go around clockwise, starting from the picnic area. 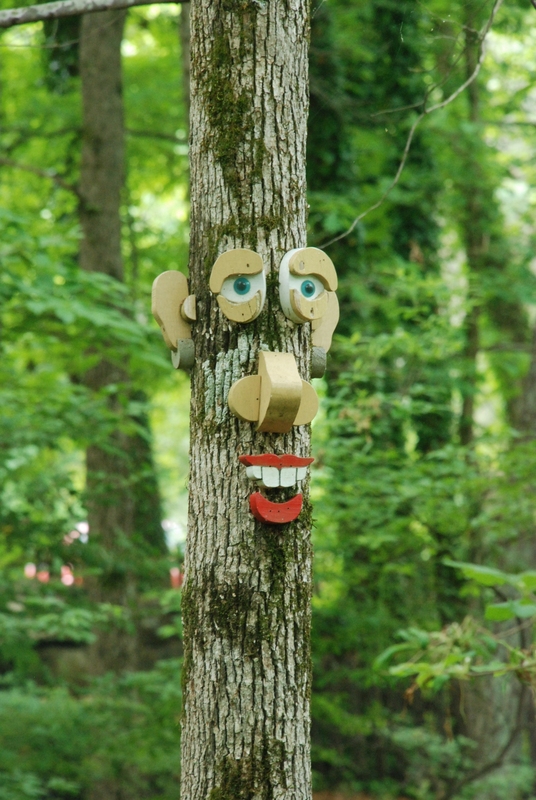 The park is well-marked throughout with directional signs and has several whimsical sights near the picnic area, such a s a water feature, folk art sculptures and even a face on a tree. 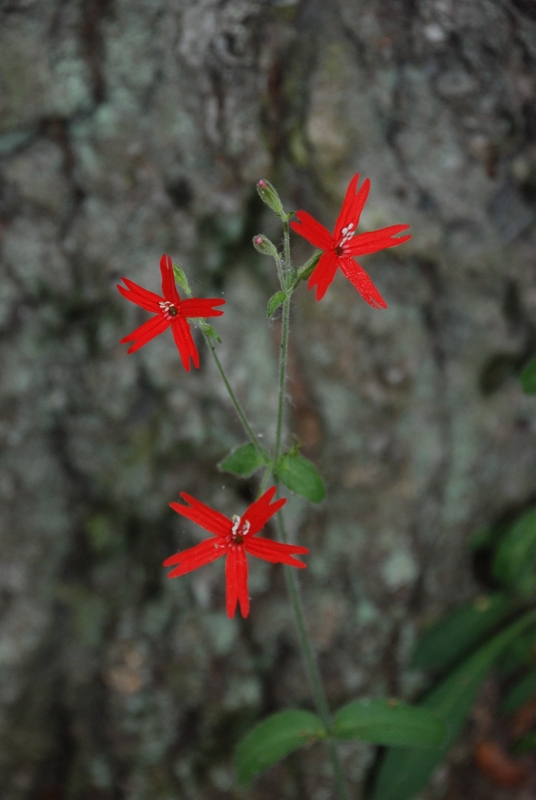 Since this is a nature trail, there are small plaques found at the base of trees and shrubs throughout the park to identify them by their common and scientific names. 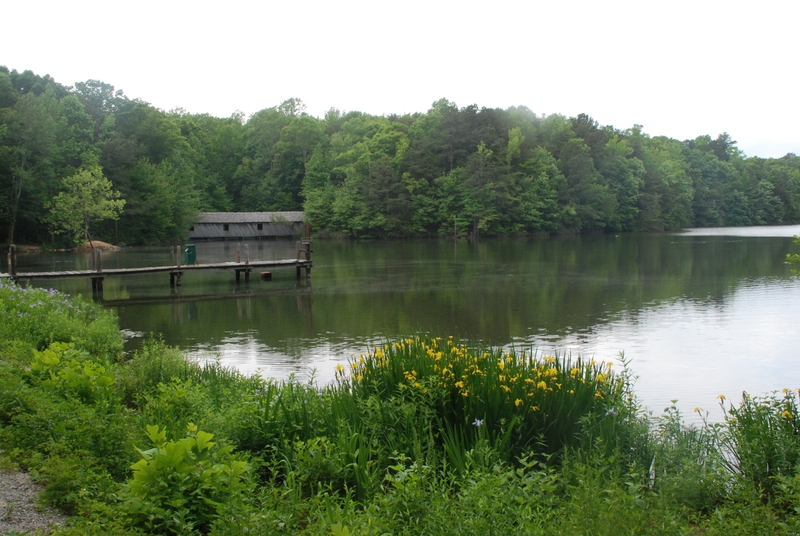 The trail crosses an earthen dam on a gravel road, with nice views across the lake to a covered bridge. 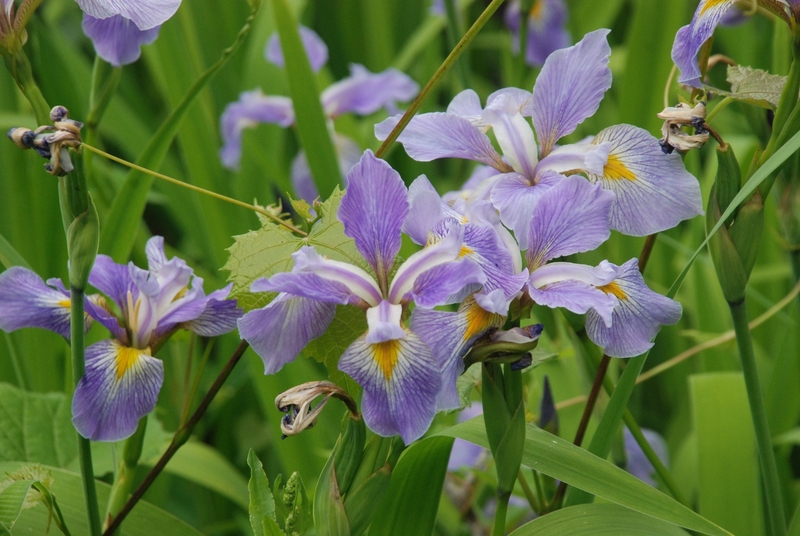 This end of the lake is beautifully landscaped with irises and wildflowers. After leaving the gravel road, the trail surface changes to wood mulch. From this point onward, the main trail is lined with landscape timbers and is over six feet wide. The trail surface varies throughout the hike, from mulch to dirt to gravel and even a few spots of blacktop, suggesting that the trail was paved at one point. This is a hiking-only trail with natural surfaces and a few roots and rocks. It would be pretty tough going for a stroller, and bicycles are not allowed. 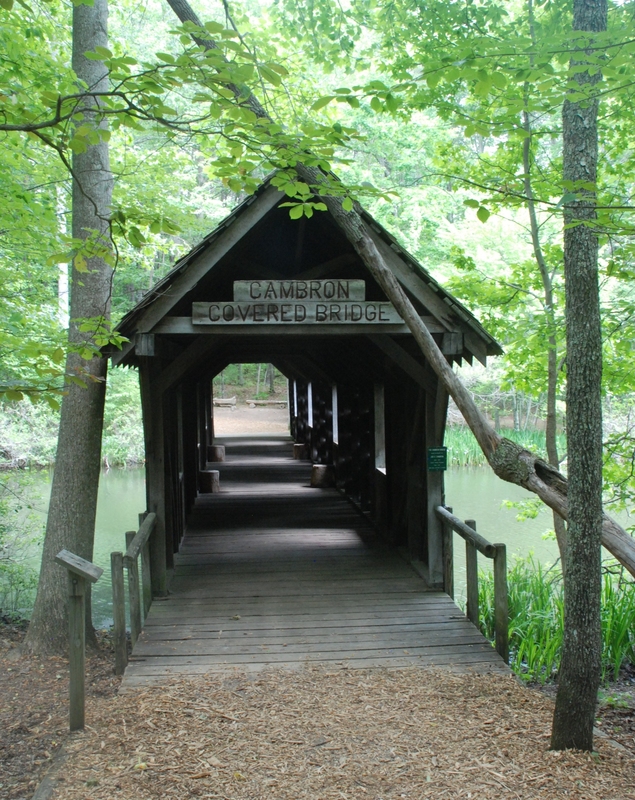 At approximately 0.16 miles from the pavilion, you’ll come to the Cambron covered bridge, a replica named after a former Madison County bridge supervisor. The bridge is scenic, if not historic, perched over an arm of the lake. 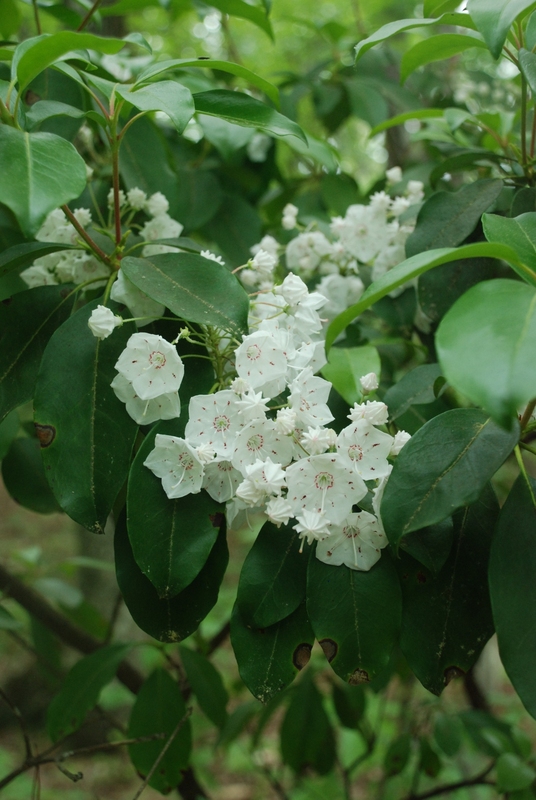 On the far end of the bridge, we enjoyed a mountain laurel in full flower. 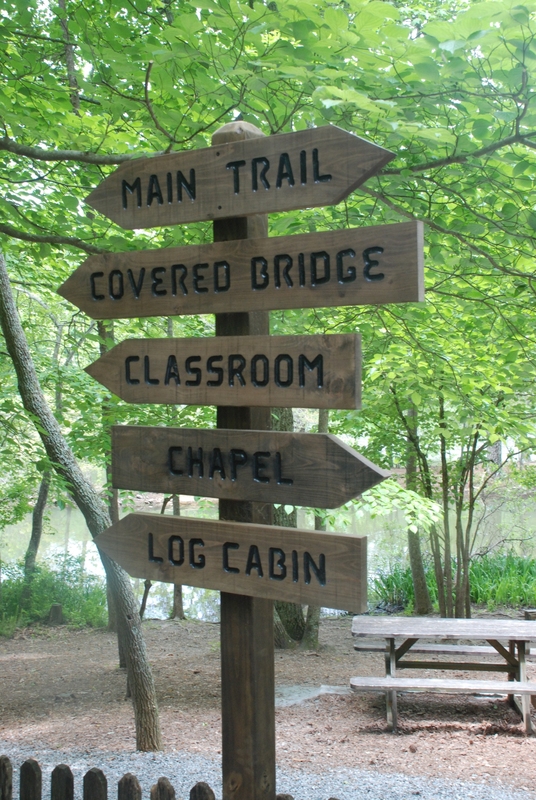 About 0.1 miles from the bridge, the outdoor classroom appears on the left. I wish my school had had one of these! There’s a chalkboard with chalk and erasers, and benches and chairs for students to absorb the lesson. A short trail, the School trail, departs from the back of this area and winds probably about 0.1 mile through the woods until it rejoins the main trail. 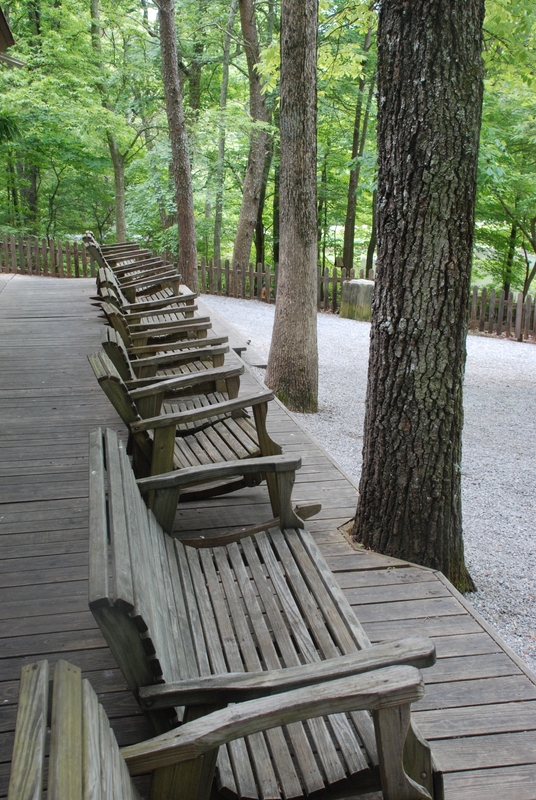 About 300 feet later, you’ll arrive at a reconstructed log cabin with a replica well. 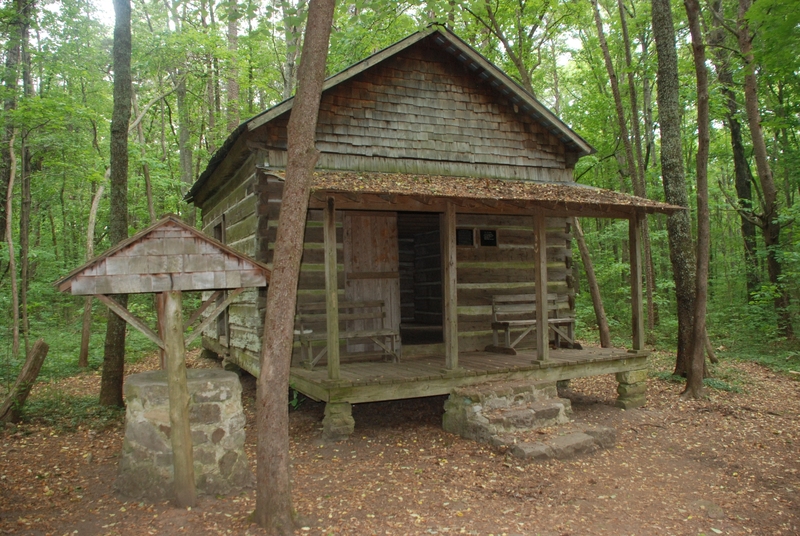 Though the cabin is not historical, its logs are the real thing, hewed around 1810 and donated for the reconstruction. You can go in the single-pen cabin and look over its fireplace and mantle, and a staircase leads to the windowless, dark loft. There’s nothing much to see in the loft, and beware of a couple of holes in the floorboards — probably not a good idea to let the kids run around up there. There are also a couple of pieces of agricultural equipment in front of the cabin for your inspection — an old cultivator and part of a plough, I believe. After the cabin, the trail winds slightly uphill, then descends back down toward the lake. 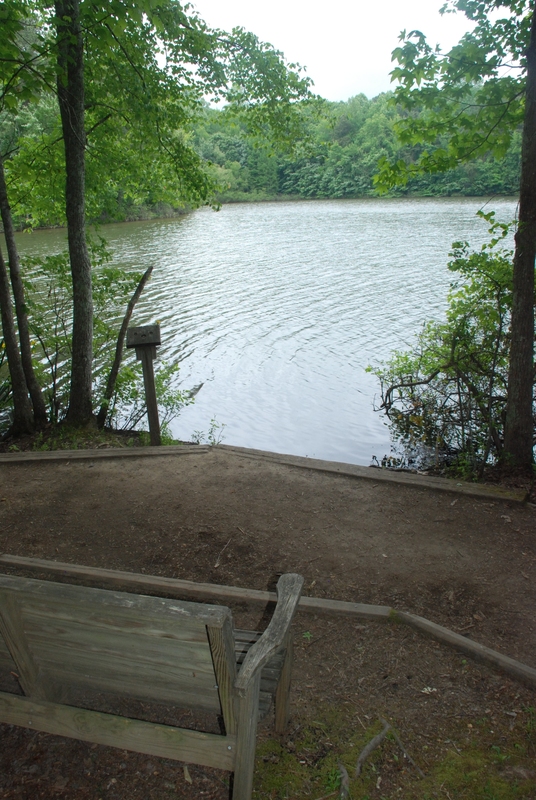 At several points around the trail, there are handy benches for resting little and big legs, often with a nice view of the lake or a forest glen. 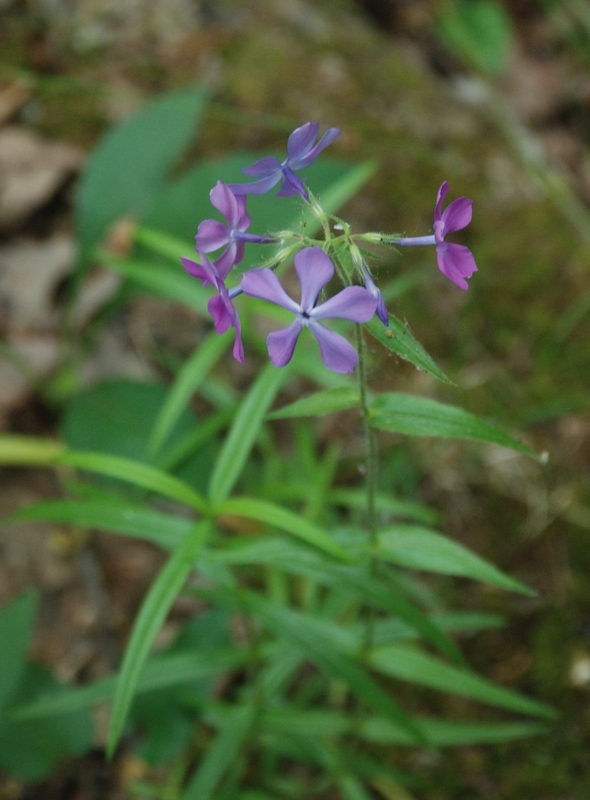 The stretch of the trail along the far side of the lake had quite a few wildflowers in bloom, including two-flowered cynthia, large houstonia, fire pink, and wild sweet william. Approximately 0.15 miles from the cabin, the trail crosses an arm of the lake on a footbridge, then continues on another 0.16 miles to a cutover trail you can take to lop off the northermost part of the hike, which would cut about 0.4 miles from your hike. We stuck with the main trail and continued on about a quarter of a mile to cross a small creek on a footbridge, right before the trail shelter on the left side of the trail. 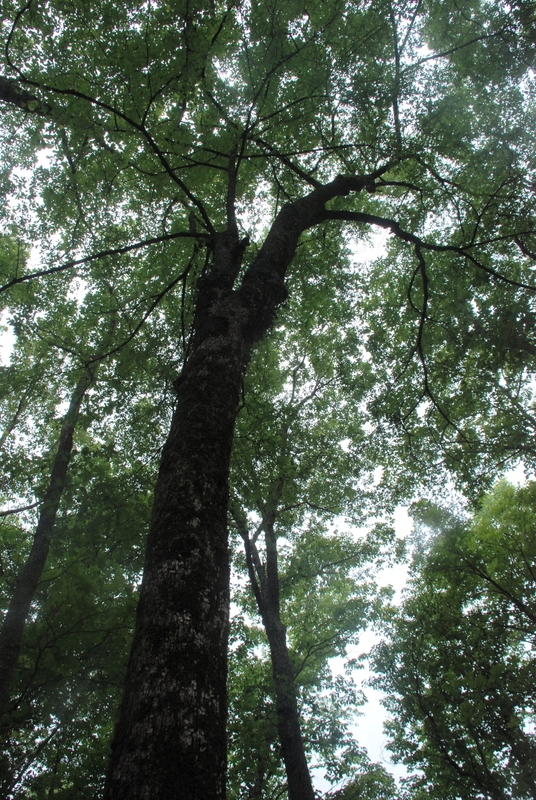 It was a nice shady spot, and conveniently it means that you are never much more than a quarter of a mile from a roofed shelter, should you be caught out on the trail in a rainstorm. Continuing on past the shelter, we reached the other end of the cutoff trail in 0.16 miles and pressed on until the main trail split, with the right fork going along the lake and the left fork heading to the chapel. We opted for the chapel, reaching it in .26 miles from the cutoff trail junction. 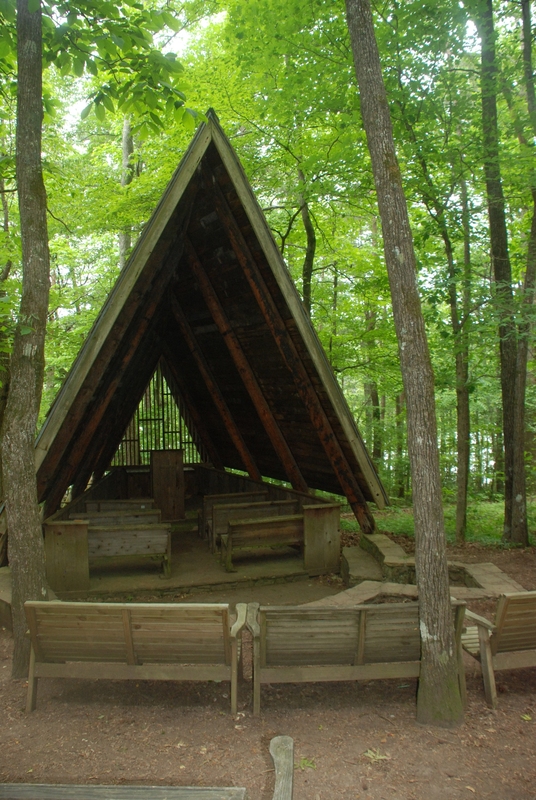 The chapel is a simple wooden A-frame structure with a pulpit, a few small pews, and a couple of rows of benches outside the structure. It’s in a lovely setting and is a popular place for weddings. Continuing on, the two branches of the main trail converge, then almost immediately branch again. 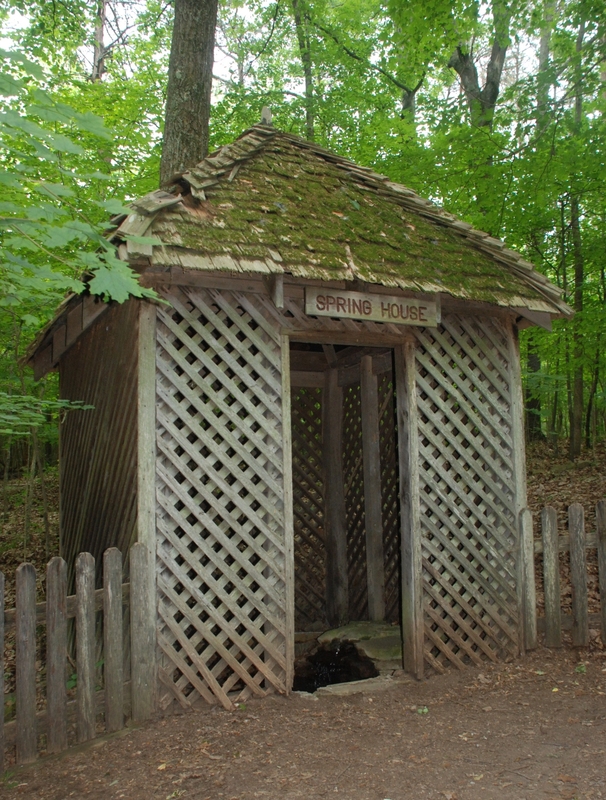 We opted to take the left branch to see the state champion winged elm tree, a recreation of a moonshine still, and the spring house. 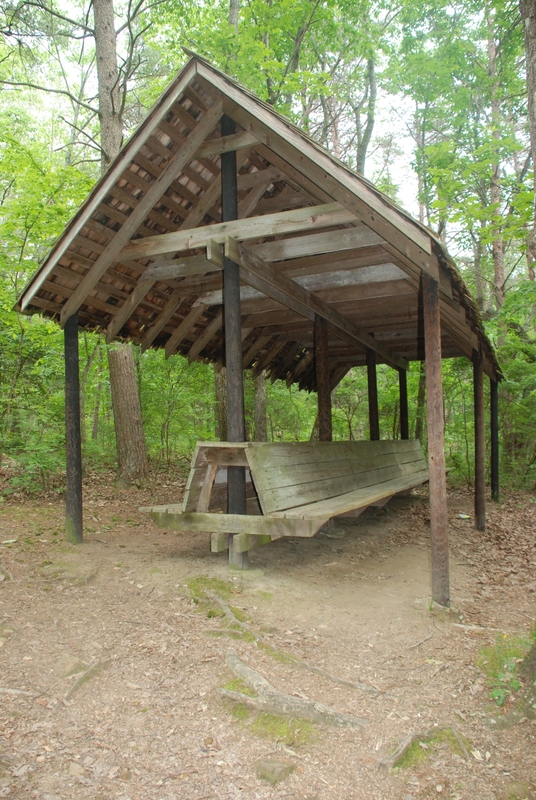 At approximately 0.11 miles from the chapel, you return to the picnic pavilion and the end of the loop. 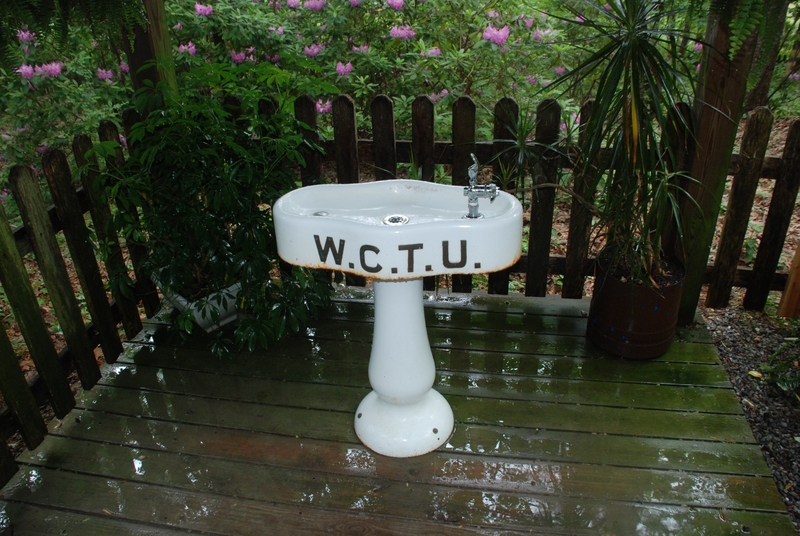 On our way out we passed another historical relic — a water fountain originally erected by the Women’s Christian Temperance Union (WCTU) on the southeastern corner of the Huntsville courthouse square. The fountain is still working, so if you’re thirsty you can have some nice refreshing water instead of the demon rum. In summary, this hike is around 1.5 miles for the entire loop, and you can extend your hike a little by taking some of the side trails. It has access to restrooms, ample parking, covered and outdoor picnic areas, various interesting structures, good signage, and a nice wide footbed with various natural surfaces. It’s not exactly a wilderness experience, but it’s a good trail for beginners.